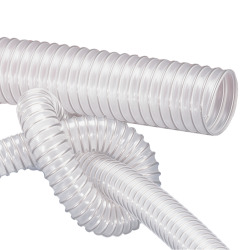 5" ID x 5.20" OD AIRDUC® PUR 350 Food AS Hose | U.S. Plastic Corp.
AIRDUC® PUR 350 Food AS Hose is medium to heavy-duty and highly abrasion resistant. It is also microbe, hydrolysis-resistant and has good resistance to oil, gasoline and chemicals. This hose is an excellent choice for abrasive powders, bulk materials, granulates and gases. It is also suitable for a wide variety of applications in the food and pharmaceutical industry for conveying of dry and frozen food, mixers, dryers, packaging machines, bulk-bag charging and discharging, mills, explosion hazard areas, clean room ventilation, semiconductor production machines, waste water and air extraction in paper mill and pulp industry, cable protection conduit, air supply hose and extraction hose for medical equipment and the healthcare sector and municipal vehicles like lawn mowers, slope mowers and leaf blowers/collectors. Permanently antistatic wall: in accordance with ISO 8031. Spring steel wire is firmly embedded in the wall.